City of the Soul: Rome and the Romantics, sponsored by the Foundation for Landscape Studies, highlights Rome from 1770 to 1870 in all its moving, amusing, and heartbreaking splendor. Authored by FLS board member John Pinto, the Howard Crosby Butler Memorial Professor of Art and Archaeology Emeritus at Princeton University, this book was written to accompany a 2016 exhibition of the same title at the Morgan Library and Museum. It contains reproductions of the sixty-seven works of art and literature selected for display by Pinto and co-curator John Bidwell, Astor Curator and Department Head of Printed Books and Binding at the Morgan. Pinto and Bidwell have assembled items that draw attention to the poetical aspect of ancient ruins—Camille Corot’s evocative The Arch of Constantine and the Forum, for instance—and the crumbling stone and overgrown vegetation of seventeenth-century villas and gardens (e.g., Gustav Wilhelm Palm’s Entrance to the Giardino del Lago, Villa Borghese, Rome). Literary treasures, such as Nathanial Hawthorne’s Italian Notebooks (1858) and Charles Dickens’s Letter to Georgina Hogarth (1845), show the degree to which Rome was a magnet for American writers. Several beautiful albumen prints demonstrate how technological breakthroughs helped nineteenth-century tourists memorialize their visits. Pinto’s introduction to City of the Soul and his instructive catalogue descriptions give the reader a new appreciation of the potent spell Rome continues to cast over visitors. Pinto and Bidwell have assembled items that draw attention to the poetical aspect of ancient ruins – Camille Corot’s evocative The Arch of Constantine and the Forum, for instance – and the crumbling stone and overgrown vegetation of seventeenth-century villas and gardens (e.g., Gustav Wilhelm Palm’s Entrance to the Giardino del Lago, Villa Borghese, Rome). Literary treasures, such as Nathanial Hawthorne’s Italian Notebooks (1858) and Charles Dickens’s Letter to Georgina Hogarth (1845), show the degree to which Rome was a magnet for American writers. Several beautiful albumen prints demonstrate how technological breakthroughs helped nineteenth-century tourists memorialize their visits. 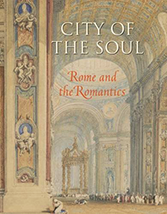 Pinto’s introduction to City of the Soul and his instructive catalogue descriptions give the reader a new appreciation of the potent spell Rome continues to cast over visitors.